This amazing vacation offers the best of both worlds: a land tour of Austria and Switzerland-two of Europe’s most scenic countries-and a river cruise on the legendary Rhine River with stops in France, Germany, and Holland! If you’re a fan of palaces and castles, you’ll enjoy a visit to Vienna, Austria’s Schönbrunn Palace, once the home of the Habsburg family. Stand in awe as you hear the stories of this royal family’s home. And in Switzerland, you’ll enjoy a visit to romantic Chillon Castle, a well-preserved, medieval castle on the shores of Lake Geneva. If spectacular scenery is your interest, you’ll be thrilled with a ride on the world-famous Glacier Express train, where you’ll travel first-class with panoramic windows to admire the thundering waterfalls, impressive peaks, glacial ice fields, and tiny villages on your way to Zermatt, Switzerland. Other scenic highlights include a Danube cruise along the prettiest part of the river on your way to Salzburg; a private boat cruise on the fjord-lake in Lucerne; a scenic drive into the Swiss Engadine, considered the most beautiful mountain area in the world; and more. Some sightseeing highlights include The Sound of Music Parish Church in Mondsee, a walk through the Old Town in Innsbruck, and the Lion Monument and Chapel Bridge in Lucerne. sophisticated elegance of the city’s architecture. in another room contain such relics as his silk wallet, buttons from his coat, even a few preserved locks of his hair. Guided tours of the festival theater complex are usually conducted in German but are worth taking even if you don’t understand a word. Of the three performance halls–the Small and Large Festival Houses and the Felsenreitschule–the last is the most unusual. An outdoor arena with three rows of stone arcades carved into the side of the Monchsberg, it was converted from a 17th-century showplace for horses. Much more modern is the Large Festival House, opened in 1960, with its enormous stage built into the mountain and its 38-ton metal curtain. Folk tradition, along with the sound of music, remains dear to the hearts of Salzburgers. houses and the elegant, often world famous hotels. Zermatt attracts tourists year after year, not only for its fresh and clean mountain air, but also for its many excellent restaurants, bars and nightclubs; the tempting, exclusive shops and boutiques and the friendly hospitality of the local residents. 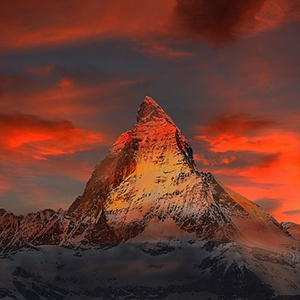 But it is the mysterious, ever-present Matterhorn, soaring like a proud sentinel into the cloudless skies that has provided Zermatt with a large quotient of its centuries-old fame.